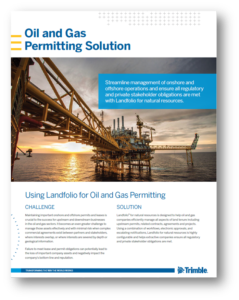 Streamline management of onshore and offshore oil and gas operations and ensure all regulatory and private stakeholder obligations are met with Landfolio for natural resources. Maintaining important onshore and offshore permits and leases is crucial to the success for upstream and downstream businesses in the oil and gas sectors. It becomes an even greater challenge to manage those assets effectively and with minimal risk when complex commercial agreements exist between partners and stakeholders, where interests overlap, or where interests are severed by depth or geological information. Failure to meet lease and permit obligations can potentially lead to the loss of important company assets and negatively impact the company’s bottom line and reputation. Landfolio® for natural resources is designed to help oil and gas companies efficiently manage all aspects of land tenure including upstream permits, related contracts, agreements and projects. Using a combination of workflows, electronic approvals, and escalating notifications, Landfolio for natural resources is highly configurable and helps extractive companies ensure all regulatory and private stakeholder obligations are met. Protect against loss of interest or access to land assets and resources. Manage complex obligations across multiple regulatory frameworks and jurisdictions. Ensure corporate governance and reduce corporate risk with standardized business processes. Ensure legal and regulatory obligations are fulfilled on time and correctly. Ensure timely business decisions can be made with a central repository of all land tract, lease, and permit data that is accessible by relevant stakeholders. Meet all partner/customer obligations and ensure that rentals and royalties are correct and paid on time. Manages and tracks legal processes, responsibilities and reporting for damages, compensation, and encroachments. Actions that model the obligations over the life of a license such as payments, reports, renewals with associated due dates and responsible roles. Manages conditions pertaining to commercial sales, operational leases and contracts. Complete inventory of wells and well units along with their associated production statistics are crucial building blocks for the establishment of working interests and revenues. Supports interrelationships between licenses, agreements and projects. Advanced GIS component enables map visualisation, selection, and validation of coordinates, restricted areas, minimum and maximum areas, contiguity and overlaps. Advanced, automated approvals set up for specified roles within the system. View and generate reports on your land-related assets, including mineral and surface assets, and their respective agreements and obligations. Manage upstream tenure, permits and commercial agreements across the oil and gas sector.